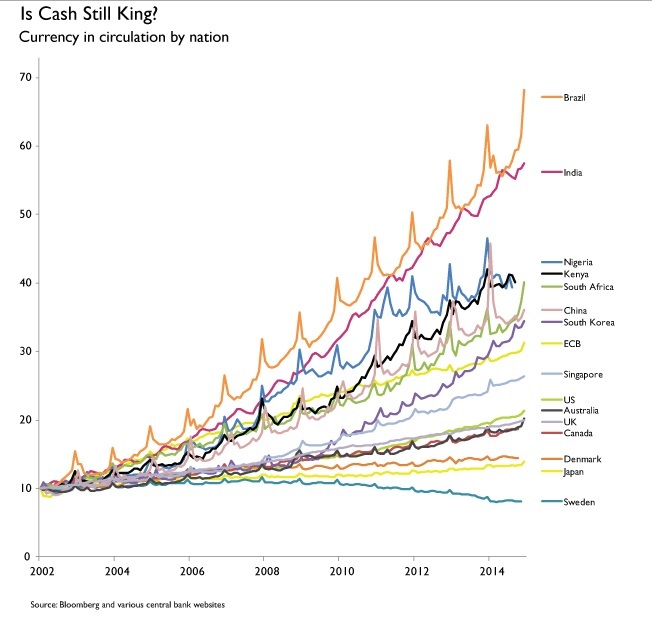 I came across this very interesting chart on Twitter (apparently actually coming from JP Koning’s excellent blog) showing the demand for cash over time in various countries. The demand for cash is a form of money demand. And it varies over time and across cultures and evolves as technology changes. In most countries, the demand for cash increases around times when the number of transactions increases (Christmas/New year for instance, although some countries, such as South Korea, present an interesting pattern – not sure why). But there are very wide variations across countries: notice the difference between the Brazilian and the Swedish, British or Japanese demand for cash. Countries that have implemented developed card and/or cashless/contactless payment systems usually see their domestic demand for cash decrease and banks less under pressure to convert deposits into cash. Overall, this has interesting consequences for the financial analysis of banks, bank management, and for the required elasticity of the currency. Every time the demand for cash peaks, banks find themselves under pressure to provide currency. Loans to deposit ratios increase as deposits decrease, making the same bank’s balance sheet look (much) worse at FY-end than at any point during the rest of the year. A peaking cash demand effectively mimics the effect of a run on the banking system. Temporarily, banks’ funding structure are weakened as reserves decrease and they rely on their portfolio of liquid securities to obtain short-term cash through repos with central banks or private institutions (or, at worst, calling in or temporarily not renewing loans)*. Central bankers are aware of this phenomenon and accommodate banks’ demand for extra reserves. In a free banking system though, banks can simply convert deposits into privately-issued banknotes without having to struggle to find a cash provider. This ability allows free banks to economise on reserves and makes the circulating private currencies fully elastic. In a 100%-reserve banking system, cash balances at banks are effectively maintained in cash (i.e. not lent out). Therefore, any increase in the demand for cash should merely reduce those cash balances without any destabilising effects on banks’ funding structure (which aren’t really banks the way we know them anyway). However, if some of this demand for cash is to be funded through debt, this can end up being painful: in a sticky prices world, as available cash balances (i.e. loanable funds not yet lent out) temporarily fall while short-term demand for credit jump, interest rates could possibly reach punitive levels, with potentially negative economic consequences (i.e. fewer commercial transactions). However, technological innovations can improve the efficiency of payment systems and lower the demand for cash in all those cases. Banks of course benefit from any payment technology that bypass cash withdrawals, alleviating pressure on their liquidity and hence on their profitability. Unfortunately not all countries seem willing to adopt new payment methods. The cases of France and the UK are striking. Despite similar economic structures and population, whereas the UK is adopting contactless and innovative payment solutions at a record pace, the French look much more reluctant to do so. 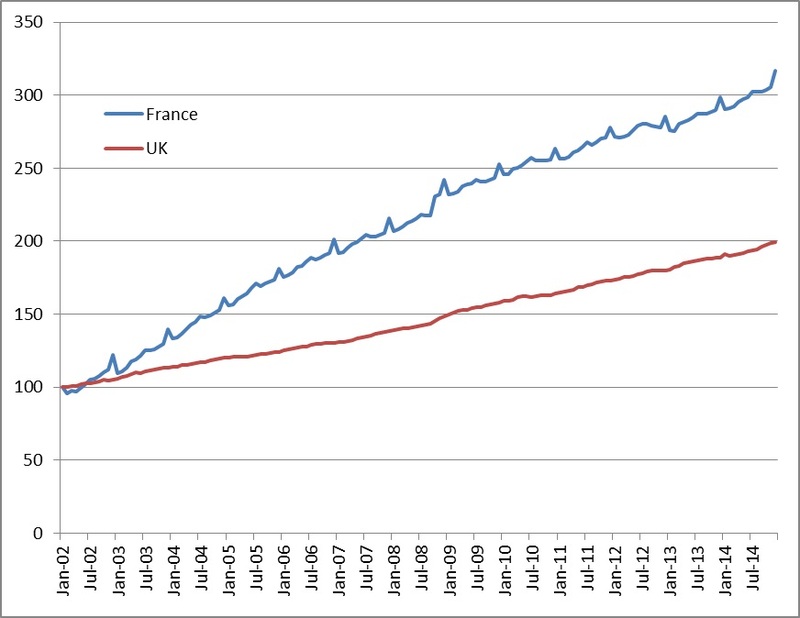 As the chart above did not include France, I downloaded the relevant data in order to compare the evolution and fluctuations of cash demand over the same period of time vs. the UK. Unsurprisingly, the demand for cash has grown much more in France than in the UK and fluctuations of the same magnitude have remained, despite the availability of internet and mobile transfers as well as contactless payments, which all have appeared over the last 15 years**. What this shows is that the demand for cash had a strong cultural component. *Outright securities sale can also occur but if all banks engage in the sale of the same securities at the exact same time, prices crashes and losses are made in order to generate some cash. ** I have to admit that the cash demand growth for the UK looks surprisingly steady (apart from a small bump at the height of the crisis) with effectively no seasonal fluctuations.